Posted on December 21, 2016 , in Swim Spas. You know a swim spa is exceptional when it offers a little something for every user. Whether you want a pool, hot tub, backyard aquatic center, wave pool, or hot tub, a good swim spa will provide you with all of these. In this blog post, you’ll learn about many versatile ways to use your Hydropool swim spa. People commonly purchase swim spas because they’re an excellent way to get a full body workout. 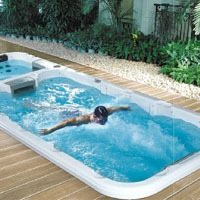 Hydropool swim spas offer a wide variety of exercise choices to keep you motivated and in great shape. If you want a customized swim that challenges you, the adjustable swim levels are ideal. To incorporate cross-training into your workout, you can use the tether cord for running or resistance swimming. Rowing kits are another option you can try to spice up your workout. Because water exercise creates zero impact, it’s a great way to exercise while protecting your joints. You can also try water weights and dumbbells to help you build muscle while you enjoy your time in the water. If you’re a competitive swimmer or triathlete, a swim spa is the ideal training investment. With adjustable resistance and speed, you’ll be able to challenge yourself as you improve. Swim spas are also ideal for triathletes because they provide you with an experience that is very similar to open water swimming. Because a swim spa doesn’t allow you to glide, turn, or use the walls to rest, you’ll be better prepared for the conditions when race day arrives. It’s also a great way to practice transitions between the water, your bike, and your treadmill. Even if you use your swim spa mostly for exercise, they’re great places for you and your family to have fun. A swim spa can function as a complete aquatic center. Kids will love splashing in the wave pool or attaching a boogie or knee board to the tether cord so they can ride the waves. With these tips, you’ll know just how to maximize your fun and fitness activities. To find out more about the wide range of swim spas available, download our buyer’s guide.